In the movies,”Ip Man 2” and “Ip Man 3”, they had a reporter character to report the challenge fights between Wing Chun and other styles. In the real life, these fights did happen during that period of Hong Kong and many of them were reported on the local newspapers. However, the fights were participated by Ip Man's students or grand students. Among them, one stood out the most. Some say he hand over 50 or 60 fights. Some say he had over 100 fights. Thus, he gained a nick name - the King of Talking Hands. He is my Sigung Wong Shun Leung. Many people credit Sigung Wong for the popularity of Wing Chun in Hong Kong due to his success in those challenge fights. He was a very low-key person who seldom talked about his challenge fights. One can find books or articles online that contain recount of some of his fights. Some of his fights were attended by a reporter who would publish a story on the next day's newspaper. Unfortunately, may be due to this was at over 50 years ago, I have yet to come across any news clip about his fights. 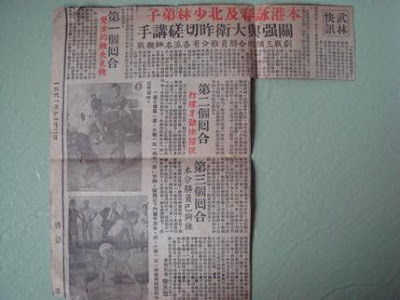 Thanks to those people who share these news clips, so Wing Chun fanatics like me have a chance to get a glimpse of the Wing Chun history. 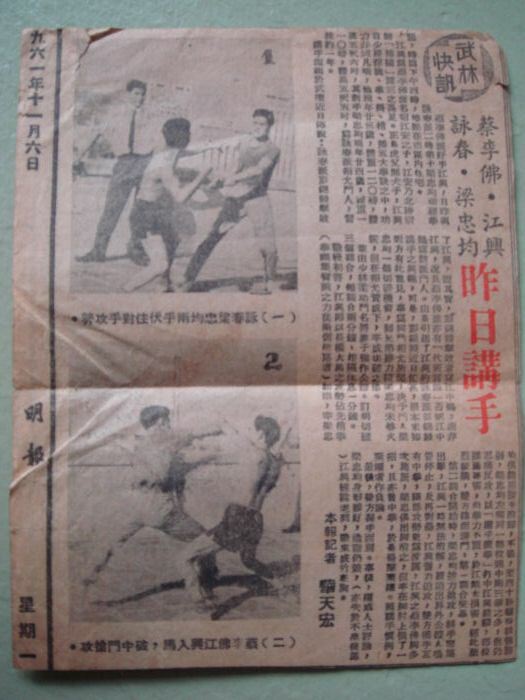 Also gave us a rough idea of how the reports might look like for Wong Shun Leung fights. Hopefully, one day we get to see reports on Wong Shung Leung's fights. After Bruce Lee took up Wing Chun, Wong Shun Leung was the notary; and for all intents and purposes Lee’s corner man, at his first fight. Under Wong's instruction Lee won this fight eventually which had a tremendous effect on his future growth in martial arts. Very rare challenge fight video from the 60’s. Wong Shun Leung's most senior disciple Wu Chan Nam fighting (Beimo) with a Northern Mantis practitioner on the rooftop.